Perfect for a beach holiday or UK seaside experience. 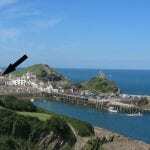 Book Direct at Ocean Backpackers in Ilfracombe Devon for the best rates in this fantastic seaside town hostel. Ilfracombe is famous for its pretty harbour, great surf beaches and Damien Hirst’s Verity statue. A must visit on any tour of the UK!